Cast: Mike Myers, Cameron Diaz, Eddie Murphy, Antonio Banderas, Rupert Everett, Julie Andrews, John Cleese, Justin Timberlake, Eric Idle, Larry King, Ian McShane, Amy Poehler. Directed by Chris Miller and Raman Hui. Another trilogy? 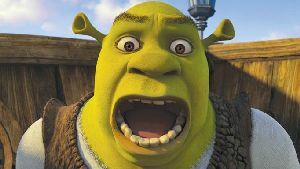 Good grief, if any series is going to make a good third episode, it's got to be Shrek. Curious then, that Shrek the Third isn't a patch on the others. To be fair, it had massive hurdles to clear. The first Shrek was a truly brilliant movie and Shrek 2 is one of my favourite movies of all time. The latest instalment has a lot going for it, but it never manages to captivate and delight in the same way. Donkey's not as funny, the plot's more contrived and it all feels far more forced than in the past. However, the animation's superb and the toilet humour is as effective as ever. The adults still get the occasional knowing chuckle without alerting the kids, who will be busy enjoying the cuteness of it. I don't want to damn it with faint praise - it is good fun and well worth watching, so don't dismiss it just because of its daunting forebears. Shrek the Third could be a lot better. It's still very pleasant to watch - worth recommending without a doubt - it's just not the clear class leader that it was. Fans may be disappointed. To enjoy this film you should: not be a devoted fan. Shrek the Third was released in the UK on 29th June 2007.